The Drug Policy Alliance issued a report saying patients and caregivers in New York State face significant obstacles to obtain medical marijuana because of geographic barriers, high product costs, and a dearth of physicians certified to recommend MMJ. The findings raise questions about the viability of New York’s medical cannabis industry as it’s currently structured, and whether MMJ prices will need to fall. The program was launched in January. DPA and Compassionate Care NY, the state’s largest grassroots organization of patients and caregivers, surveyed 255 people who had sought to access the state’s MMJ program. A longtime cannabis activist in Hawaii has filed suit in U.S. District Court in an attempt to stop state-licensed medical marijuana dispensaries from opening later this year. The suit is the brainchild of activist Mike Ruggles, who also faces criminal charges for illegally selling cannabis through a now-defunct MMJ collective, West Hawaii Today reported. Ruggles’ suit argues that the dispensary system violates federal law, and should therefore be overturned. A group of entrepreneurs, a former United States Attorney, farmers, state legislators, scientists, and environmentalists have petitioned the U.S. Drug Enforcement Agency to change its definition of marijuana to make it easier to grow a wider variety of industrial hemp plants. The current DEA definition of marijuana is too broad, and wrongly includes hemp, said Andy Kerr, one of the petition authors and a founding board member of the North American Industrial Hemp Council. Can the CEO of Texas Cannabis Soften the State’s Approach to Pot? Patrick Moran, CEO of Texas Cannabis, plans to turn the former cotton gin in Gunter into a facility to produce cannabis oil. The old cotton gin on the west edge of Gunter seems an odd place to launch an economic boom. A breeze blows through broken windows and holes in its rusting, corrugated metal walls. Inside, a half-dozen or so squat machines that once separated cotton from seed sit corroding in a jumble of elevated metal walkways and busted machinery. Fistfuls of cotton, blackened by age and dirt, still rest in their bins. High above, a buzzard ruffles its wings from its perch on the edge of a gaping hole in the roof. Visitors have driven it from the eggs it’s brooding in a tin flue near the gin’s floor, so Patrick Thomas Moran urges his guests to step outside. “We don’t want to disturb the mamma buzzard,” he says. A buzzard setting up a nursery on a factory’s floor is generally a good sign that the time has come to call in the wrecking crew and start looking for greener pastures, but Moran has plans to relight this old gin with a new cash crop, even if he has to ruffle a few feathers. 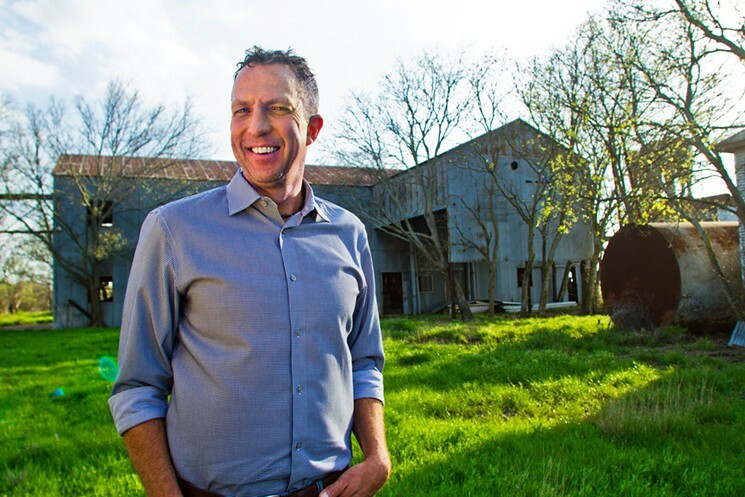 The CEO and managing partner of AcquiFlow LLC, which bills itself as “the first open, transparent and legal Texas-based cannabis company,” wants to strip out the old machinery and build a cannabis oil production facility inside the gin’s old shell. For more on the state of marijuana in Texas, visit the Dallas Observer‘s full story. The post Can the CEO of Texas Cannabis Soften the State’s Approach to Pot? appeared first on Toke of the Town. Two campaigns to legalize medical cannabis in Arkansas could wind up killing each other in November if both of them somehow qualify for the ballot. “It will be enough to split the vote and both will fail,” one MMJ campaign manager told the Associated Press. Arkansans have already rejected medical cannabis once before, in 2012, when 51% of voters shot down another statewide initiative. This year, one proposed ballot measure – by Arkansans for Compassionate Care – needs 67,887 signatures by July 8. If successful, it would change state statute and legalize MMJ.